Go see Evil Dead The Musical at the Diesel Playhouse downtown! GOOD NEWS: Evil Dead The Musical can be seen all across the U.S. and Canada. It’s one heck of a bloody, gory, splattering mess of a musical. It is a trip! Oh, and it’s funny, too. It’s not cheap… $50 a ticket! But it’s worth every penny. Trust me. Well, the night we were in town, there was hardly anything going on. It was a weekday (Wednesday). Fortunately the last brochure we spotted in the tourist display of ‘fun things to do’ at our hotel was for Evil Dead: The Musical. It’s a combination comedy routine and a play, so we had all our bases covered! Jim and I had never heard of Evil Dead before, but this musical rendition of Sam Raimi‘s hit series of movies has been getting rave reviews for quite awhile now. And supposedly, if you’ve seen the movies (Evil Dead, 1983; Evil Dead 2: Dead By Dawn, 1987; among others), they say you’ll enjoy it even more. Evil Dead: The Musical definitely has a cult following inToronto locals …and beyond! As I alluded to in the intro, there is blood, guts, and gore from start to finish (and a million laughs to boot!). For many, the biggest “draw” to see this play is the fact that you’re likely to get splashed (or dumped on) with the bloody mess. They try to confine it to “the splash zone” up front nearest the stage. But red gunk has a tendancy to fly in other directions sometimes… so what are ya gonna do? Laugh and enjoy it like the rest of ’em! Some take this experience so seriously that they show up wearing rain coats and hats to the show. Still, the staff hands out ponchos after the first intermission for those who came unprotected. In reality, it doesn’t matter… the act of being one of the lucky ones who got splashed is largely what brings people to this show in the first place. And we learned that many (I mean many) of the locals actually make it a ritual and attend the show quite frequently. Hey, if I lived in Toronto, I’d probably go a couple times each year, too. And it would definitely be tops on my list of places to take friends and relatives who came to town for a visit. And just to clarify… you can get tickets for the “splash zone” for around 20 bucks, I believe — much less than the price those of us who want to remain dry must pay. But it’s still worth it. And, while we sat front & center (just past the splash zone) there’s really not a bad seat in the house. It’s a relatively small theater, so you always get a good show. Much to my surprise, there was also a New York Broadway series for Evil Dead: The Musical, but it closed on February 17, 2007. It used to be at New World Stages. 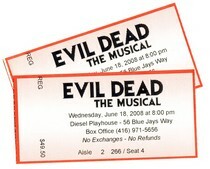 So, if you’re going to be near downtown Toronto, and you’re looking for something completely unique and fun to do… be sure to get your tickets to see “Evil Dead: The Musical” at Diesel Playhouse.